This is a beautiful ride, with gorgeous wooded trails on a mountainside, creeks, and mountain vistas. Recommended for intermediate riders to experienced riders, but can be tailored for beginners. Mountain trails, log cabins and barns, and rushing creeks. Recommended for intermediate to experienced riders, but can be tailored for beginners. This is a wonderful ride past mountain farms and log cabins, then into conservation wilderness with wooded mountain trails, waterfalls, and rushing creeks. Recommended for intermediate to experienced riders, but can be tailored for beginners. 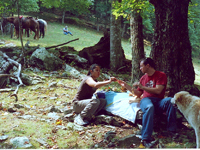 Log cabins, wildflowers, wooded mountain trails along a rushing creek, and a stop for a hearty picnic lunch. Tailored to any skill level. This is a beautiful ride up a mountain cove that is still farmed by descendents of the original 1700s pioneers. You’ll ride up a gently sloping road with gorgeous mountain views. Riding alongside a rushing creek, lush farmland, and antique barns, you’ll tie up for lunch in a wooded glen. This ride is 2 1/2 to 3 1/2 hours, and tailored to any skill level. This is a ride you won’t forget. Ride past historic farms along a bold creek and climb upward on a mountainside through forest and meadows with long and close-range mountain views. Includes a hearty picnic lunch. 3 or more hours, this ride is recommended for intermediate riders, but can be tailored for beginners. A beautiful and leisurely ride exploring the historic farming valley of Big Sandy Mush. You’ll ride past rushing creeks, log cabins, historic farms, on mountainsides and have a hearty picnic lunch in a meadow with mountain views. Over 5 hours, this ride is recommended for upper intermediate to experienced riders. The riding experience of a lifetime. Ride through beautiful woods on a pioneer wagon road, then enjoy a linens-and-silver gourmet lunch in a meadow with a mountain panorama. This incredible ride lasts 2 or more hours, includes a three course luncheon, and is tailored to any skill level, even “never been on a horse”. A hand-led ride for children or those who prefer to not ride on trail. Not just “round and round in a ring”, this is a mini trail ride. 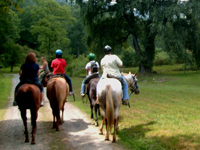 Riders are mounted on horses specially selected for gentleness, and our guides on foot lead the horses through our woods and pastures to the old log settler’s cabin. Join us for an outdoor adventure you’ll never forget! beautiful country you’ve ever seen. Just minutes outside of Asheville, explore the beauty of the North Carolina mountains in a new way. This is not just camping, this is glamping—truly glamorous camping! Ever dream about taking an overnight pack trip but not ready to rough it on the cold, hard ground? 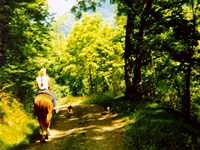 This is overnight horseback riding with all the fun, but without the discomfort! And it’s tailored to any level, even first-time riders. Ready for adventure? Click here for more details. Ride your horse past lush meadows, log cabins, and wildflowers to our creek-side outpost. We’ll break out the lemonade and you can pitch some horse shoes and wade in the creek while we start up a wood fire. Then we’ll cook up a feast—steak and chicken skewers, fire roasted vegetables, and all the trimmings. After lunch you can toast some marshmallows and enjoy the mountain views. This ride can be tailored to any level, including first-time riders. Some of your folks don’t ride? They can still join the fun! We’ll load them up in our farm truck for a hayride and meet you at the outpost. Click here for information on this true mountain adventure. Reservations are required, a minimum of 24 hours in advance. Reservations for overnight rides must be made at least 3 days in advance. 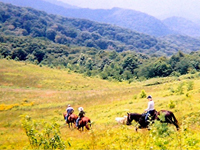 For trail ride information and reservations, please contact us at info@RandallGlen.com , or call us at 828-683-5758. *Please note- We understand that life is unpredictable and you may need to cancel your ride. Preparing horses for the trail takes a considerable amount of time and effort. For this reason, any reservation cancelled with less than 3 hours notice will be subject to a saddling fee based on the size of your party. Click link above for overnight ride cancellation policy.